The court trying Saddam Hussein cancelled the resumption of his trial Tuesday, delaying the session for five days, after some judges opposed the appointment of a new chief judge in a last-minute shakeup. The delay and judges' dispute were the latest sign of disarray in the trial of the ousted Iraqi leader and his former regime officials, calling into question the fairness of what is meant to be a landmark step in Iraq's political progress. 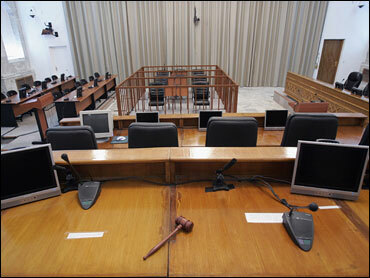 The trial has already been marred by delays, assassinations and chaotic courtroom outbursts by Saddam. The latest postponement came a day after a new chief judge was appointed following the resignation of his predecessor and another member of the five-judge panel was ousted. After hours of waiting for Tuesday's court session to begin, court official Raid Juhi told journalists that the court had decided to postpone the hearing until Sunday. CBS News correspondent Susan Roberts reports he said the delay was because "some of the witnesses who were due to appear today have been unable to attend because some of them were performing the pilgrimage" to Saudi Arabia, which ended more than a week ago. Juhi refused to take any questions. But two judges said the members of the panel hearing the case were arguing over the appointment of the new chief judge, Raouf Rasheed Abdel-Rahman. Some judges opposed the appointment, while others supported Abdel-Rahman, one of the two judges said. He said the arguments were still going on as the postponement of the session was announced. The other judge appeared to complain about outside interference in the court. When asked what the problem was, he replied, "Matters are not in our hands." It appeared some members were trying to bring back the former chief judge, Rizgar Mohammed Amin, or the another jurist who was removed from the panel, Saeed al-Hammash. The two judges who spoke to AP were members of the Special Tribunal trying the ousted Iraqi leader, though not necessarily sitting on the panel hearing the current case. They both spoke on condition of anonymity since court rules bar most judges from being named. Amin, the chief judge who presided over the first seven sessions of the trial since it began Oct. 19, submitted his resignation Jan. 15 after complaints by politicians and officials that he failed to maintain control of the proceedings. Saddam and his his half brother and co-defendant, Barzan Ibrahim, have frequently interrupted the court with outbursts, speeches and complaints. In one session, Saddam refused outright to attend. Barzan, a one-time chief of Saddam's intelligence, has been more belligerent, insulting witnesses, one of the judges and the three prosecutors. Initially, court officials said Amin would be replaced by his deputy, al-Hammash, a Shiite. However, the government commission responsible for purging members of Saddam's Baath Party complained last week that al-Hammash should not serve as chief judge because of his one-time membership in the former ruling party. On Tuesday, al-Hammash told AP he was not at the court and did not know the cause of the postponement. But he said the laws for naming the judges "should be applied in the right way." Asked if he might be asked to return to the court, he said, "We rule nothing out. We are waiting to see." The man finally appointed to stand as chief judge, Abdel-Rahman, a Kurd, was born in Halabja, the town where Saddam's forces allegedly launched a poison gas attack in 1988 that killed 5,000 Kurds. Some relatives of Abdel-Rahman were among the dead, according to his family. Saddam is expected to eventually go on trial for the Halabja deaths. But the current trial, which began Oct. 19 and was holding its eighth session Tuesday, is for the killings of about 140 Shiites in a crackdown that followed a failed assassination attempt in 1982 against the former ruler in Dujail, 50 miles north of Baghdad. The proescution intends to press ahead with this case, calling in more witnesses, Roberts reports. Saddam and seven co-defendants could face the death penalty if convicted in the Dujail case. The trial has been divisive in a post-Saddam Iraq where sectarian tensions fueled by a Sunni-led insurgency are threatening to tear the country apart. Sunni Arabs loyal to the former leader took heart from Saddam's outbursts during the hearings, which are televised nationwide with a 30-minute delay. But Shiites and Kurds, including senior politicians who had opposed Saddam's rule for decades, found the relative freedom he has had in the courtroom an affront to the memory of his victims and the feelings of their families.